Gavin Munro nurtures young trees in specially designed plastic forms, conducting pruning unwanted shoots and making new scions, thus to form a very rigid joint. 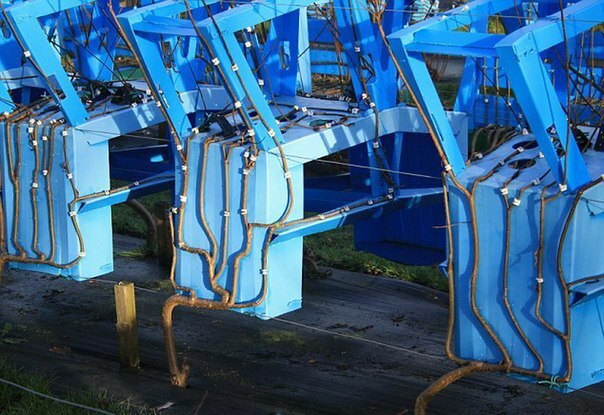 Using this method, he has created several prototypes and has the whole field in Derbyshire, where he currently is raising a crop of 400 tables, chairs and lampshades, which he hopes to raise next year. Inventor believes that his technique is growing, which has been dubbed Botanical manufacturing, one day maybe used to organize sustainable and environmentally friendly in the process a much larger scale. This ingenious idea came to him in the head while working as a gardener in San Francisco, where, in addition to direct responsibilities, in his spare time he was engaged in the manufacture of furniture out of driftwood. Remembering the old tree-bonsai in the garden of his mother, which resembled a throne, he decided it would be easier to grow furniture as a whole, than to cut Mature tree to pieces, and then to collect from them the finished product. Its production technology of furniture, in fact, is a natural analogue of 3D printing and requires no mounting elements. Moreover, the resulting joint is much stronger compounds made in the traditional way, just as a broken bone in the seat of fracture becomes stronger. While Munro uses in his the designs of fast-growing willow, but also experiments with other species of trees. In his garden there is furniture maple, hazel, wild Apple, sycamore, ash and even rock and red oak. He created the company is Full Grown, in addition to the cultivation of already developed designs, works on more complex products, including bookshelf and chest of drawers.